Summary: Tibbles is feeling down after being scolded by his newspaper editor for his inability to write about anything but cats. He’s distracted by his worries when he comes across a young woman who’s been chased up a tree by a dog. After rescuing her, Tibbles invites her back to his house, where she proceeds to purr, rub her head on his shoulder, and finally settle down to sleep in a cardboard box lined with newspaper. It comes as little surprise to learn that Miss Minou began life as a cat, and an unfortunate accident has turned her into a human. She can still talk with cats, thought, and their little town has plenty of those, each one a source of news from the humans they live with. When Miss Minou starts sharing her stories with Mr. Tibbles, his newspaper career takes off; that is, until he writes an article accusing the wealthiest man in town of some pretty dastardly deeds, witnessed only by cats. No one believes his story, and his career is once again in jeopardy. Meanwhile, Miss Minou has a one-time-only chance to return to her feline form. Will the cats of the town be able to give this unlikely couple a happily-ever-after ending? 160 pages; grades 3-6. Pros: This charming story is a classic in the Netherlands, where the original, entitled Minoes, has been loved by children since 1970. 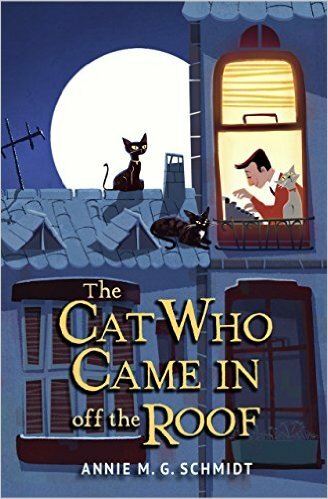 With a quirky but lovable cast of both feline and human characters, this would make a great read-aloud for kids from the primary grades on up. Cons: The wealthy villain bore an unfortunate resemblance to a certain billionaire presidential candidate. This book sounds like so much fun. I’m okay with the villain being like Trump.